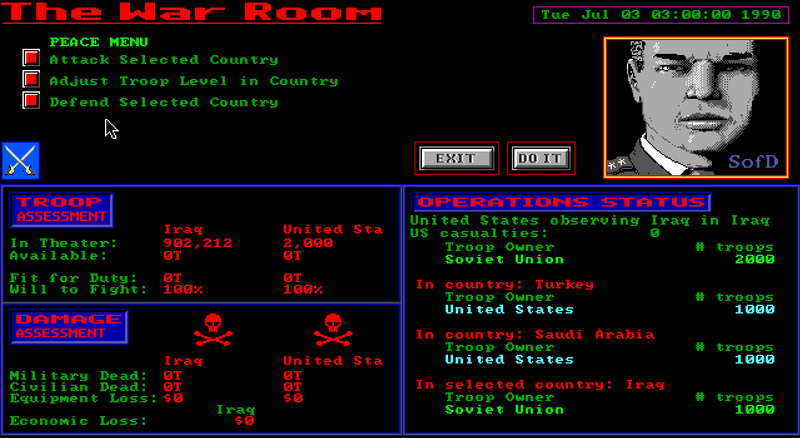 Simulation games, like strategy games, are another genre that has almost always been the sole domain of the PC, largely owing to their cerebral nature and their often convoluted control setups, necessitating the convenience of a mouse and keyboard to keep track of their numerous commands. There have been a lot of variations on the genre; everything from playing God and creating life on a planet to managing cities to launching successful war campaigns across continents, entire planets or even entire galaxies. However, there is only one I know of that puts you in the shoes of the most powerful man on Earth. Released in 1993 by an obscure little company called "D.C. True", Shadow President is what its name implies - you are the president of the United States in the early 1990s. 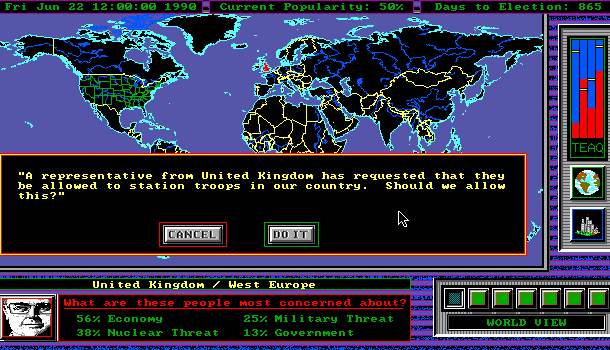 Giving it a bit of a cyberpunk edge, though, you are granted access to the "Shadow Network", which allows you to monitor communications and countries' actions on a global scale. However, this comes at a price - you must maintain your approval rating for continued access. Should you be impeached, overthrown or voted out of office (or assassinated, obviously), the game is over. However, unlike real modern politics, you are not limited to two terms - you can theoretically be re-elected as many times as you wish provided you maintain your popularity and win elections every four years. And that's the general premise. Like many games of this type, this could also be considered something of a "sandbox" in that there is no end goal defined by the game. 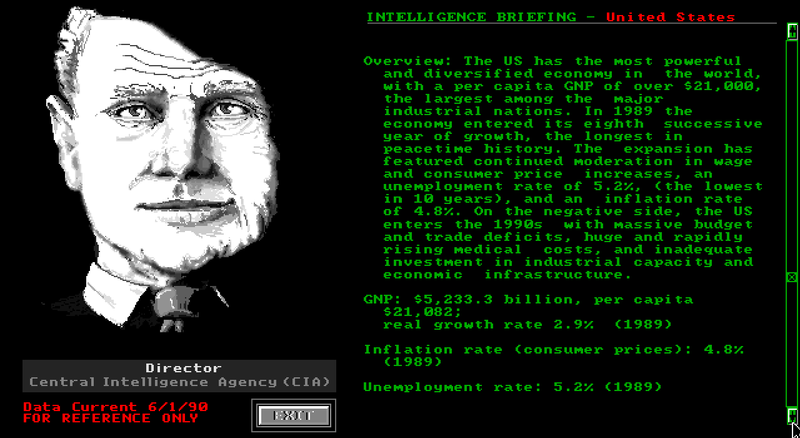 The choice of what to do with the Shadow Network is entirely up to the player, so whether you wish to be a hawkish warlord, a great peacemaker, finally eliminate America's budget deficit, or just go nuts and start nuking everyone (a seeming favorite among many Let's Players), it's all valid. To achieve your ends, whatever they may be, you have many tools at your disposal. 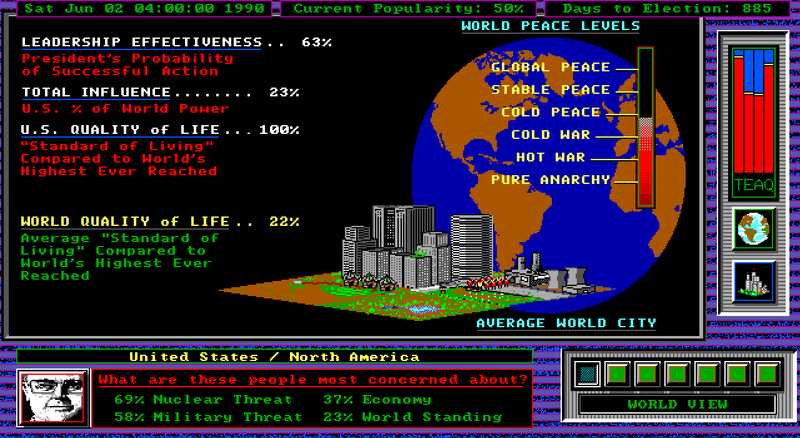 In addition to your cabinet (who will advise you on current events, the country currently highlighted, and whatever actions you elect to take), you also have a variety of filters to view the world map through, showing off everything from population levels to team alliances to nuclear spending. You've also got the CIA world factbook (very comprehensive and up to date for 1990) and a slew of various charts and graphs to comb through. Probably the most useful of those is the ever-present bar on the right, indicating (from left to right) the highlighted country's total worldwide influence, ethic level, ambition to increase power, and quality of life. 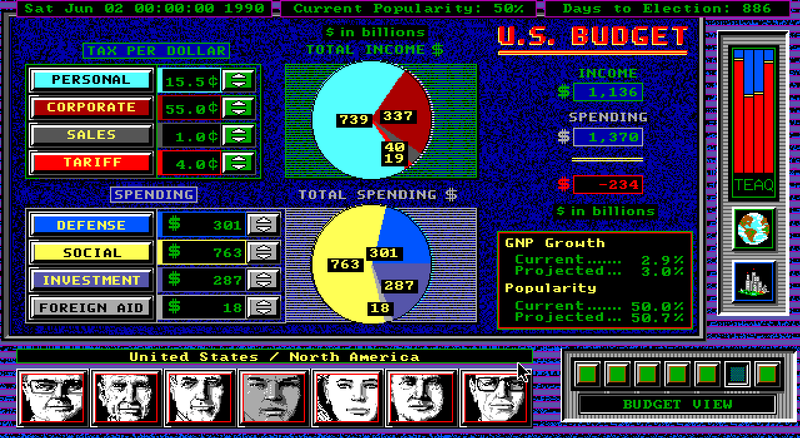 Each one is also given a yellow highlight to indicate how it compares to the current levels of the United States. Why yes, you can charge corporations 97 cents on the dollar in taxes. Probably won't do your economy any favors, though. As the game begins, you're not exactly in the most auspicious of places. 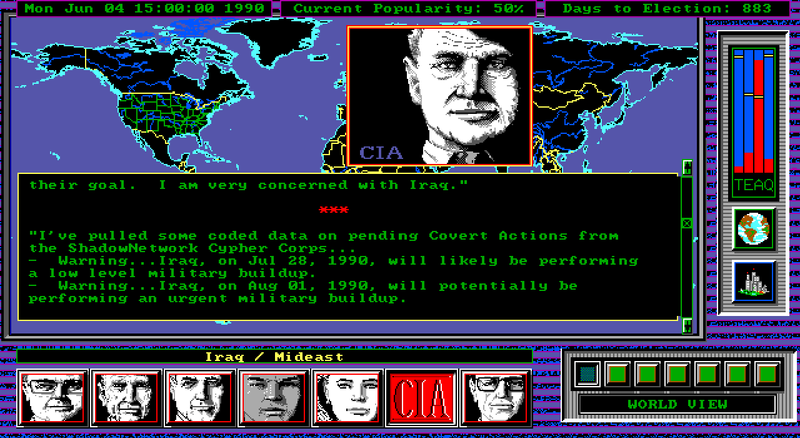 You're saddled with a hefty budget deficit, heavy worldwide concern about nuclear war and, as the game's tagline implies, nobody has heard of Desert Storm. 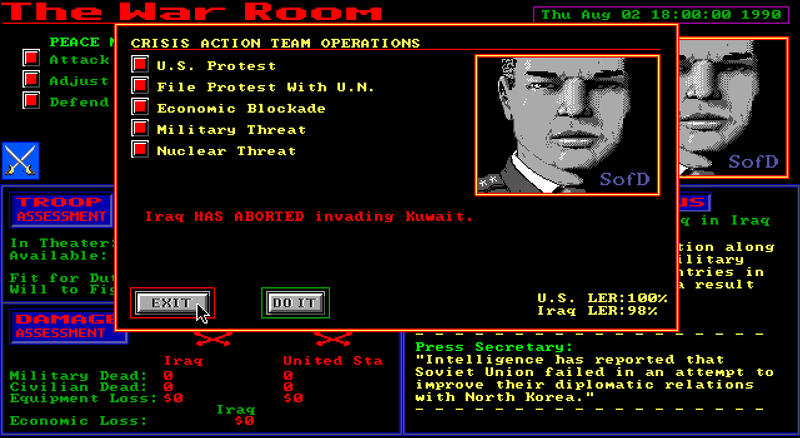 Iraq is set to invade Kuwait full-force, and barring some intervention on your part, they'll most likely succeed. Beef up your troop levels in the region and be ready for a fight. Which is usually how this scenario goes down. ...Huh, wow. I've never actually gotten them to back down before. Usually they just disregard any threats and go straight to invading Kuwait. Of course, even with that crisis solved (whether temporarily or permanently) things are never idle for long in the world. The Soviet Union, North Korea and China are all vying for power themselves, and numerous smaller states are apt to commit terrorist attacks or launch wars against their neighbors. Not to mention things like natural disasters, political scandals and the odd assassination attempt making your life more difficult. If you find the standard game too easy, you can always load up some tougher ones through the "Load Scenario" command. Such as the Super-Iraq scenario, wherein Iraq has conquered Saudi Arabia, controls 46% of the world's oil reserves and has acquired global nuclear launch capabilities. Or how about a scenario where the Soviet Union's economy collapses, China grows more ambitious by the day and Japan is starting a nuclear arms program? Yep, that's a thing too. Unfortunately there are only four scenarios included with the game; I really would have liked to see a wider variety of possible disasters you would try to resolve, a la Simcity 2000. Or even the option to make your own. 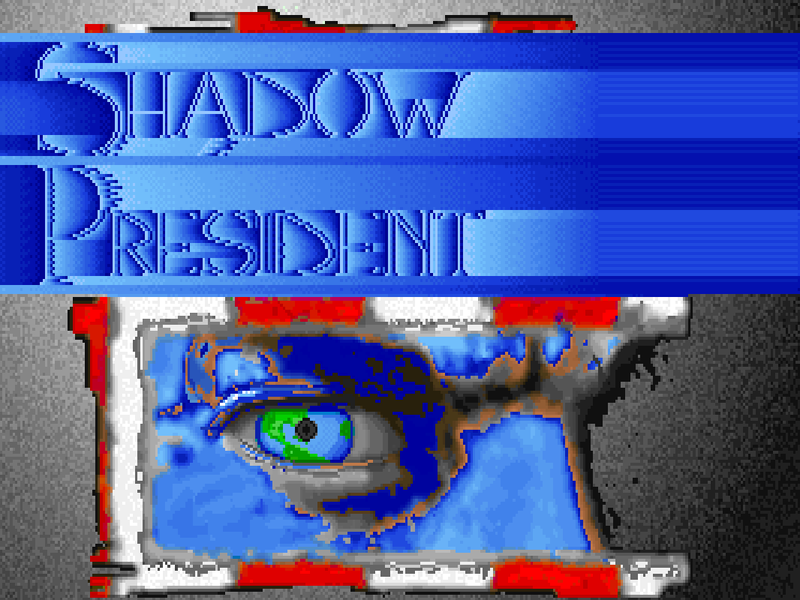 For its era, though, Shadow President is a very impressive title, offering a staggering amount of depth and player freedom to handle world affairs. You can take steps to build up countries or push them to ruin, make allies or enemies, push the nuclear arms race to its breaking point... anything goes. Of course, the challenge comes in trying to counterbalance your grand plan against the constant threat of the popularity meter - you're going to have a hard time launching war campaigns when your country has a low Ambition level, for instance.